A tour of Higher Ground Saint Paul shows off the capital city's model approach to emergency shelter and short-term housing for the state's homeless and most in need. GMHF staff had the opportunity to tour one of the latest achievements in affordable housing and serving homeless individuals: Higher Ground Saint Paul, the new shelter and supportive housing development in downtown Saint Paul developed by Catholic Charities, under the leadership of Tim Marx, CEO. Higher Ground is an incredibly inspiring development in its scale of addressing the need and its success in bringing together state and local government partners, downtown business leaders, city officials, and the funding community to make this happen. It replaces the old Dorothy Day Center, a former daytime facility for the homeless that was not designed to be an overnight shelter. Out of necessity the Dorothy Day Center had provided mats on the floor since 2011. Hundreds of people would line up outside the shelter in the evenings to access a spot to sleep, but still people were often turned away due to lack of room at the facility. The new space at Higher Ground is gracious designed with plenty of access to natural light and includes lounge areas, a computer lab, an outdoor rooftop patio and green roof, and a gathering space with a grand piano. Separate dignified shelters: Semi-private bunk beds for men and women in separate quarters. Each bunk bed includes electrical outlets, space for personal belongings, and bed linens and guests have access to showers and a meal. 172 beds for men, 60 beds for women. Pay-for-Stay Shelter for Men: Guests can reserve a bunk with a locker and access to showers. 60% of the guests are working. Cost is $7/night, $42/week. 48 beds. 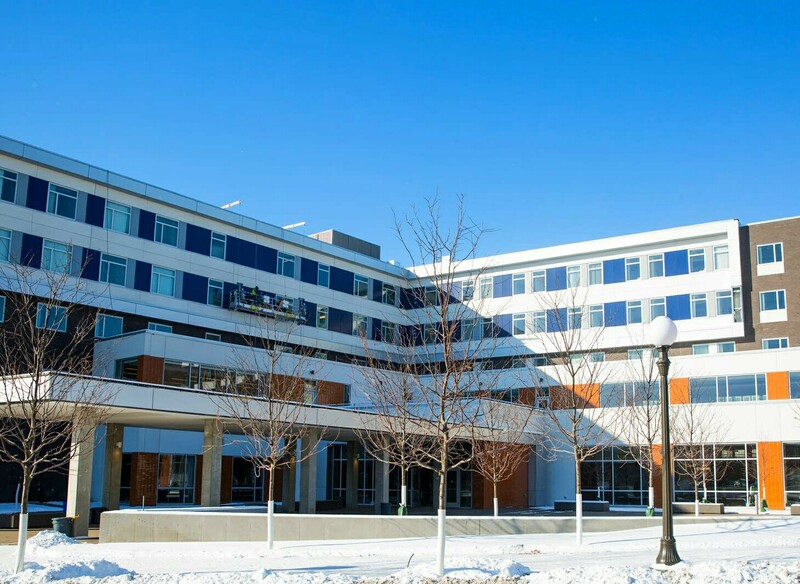 Permanent housing for formerly homeless: Single-room occupancy (165 units); a medical respite wing (16 beds); and a wing for late-stage alcoholic women (12 beds). The new Higher Ground facility, which opened in January 2017, represents Phase I of a two-phase development. Next up is the Saint Paul Opportunity Center and Dorothy Day Residence, to be constructed across the street and connected via skyway. Construction is scheduled to begin in spring 2017. In partnership with Ramsey County and several nonprofit partners, the Saint Paul Opportunity Center will provide job training, physical and mental health clinics, a Veterans Resource Hub, and housing retention and placement services. The Dorothy Day Residence will provide 171 more units of affordable housing with special focus on housing young adults and veterans. Once complete, Catholic Charities’ Dorothy Day Place will have a transformational impact on thousands of lives and will be a key milestone for advancing the statewide plan to prevent and end homelessness.